The Foley Group consists of Architectural, Interior and Landscape design and has a wealth of experience to offer, with over 30 years of general practice both within the high-end residential and commercial sectors. Rob Campbell, the lead architect of Bullendale, has endeavoured to blend aesthetics with functionality while aiming to incorporate the occupants' lifestyle into the design. At Bullendale, Rob has achieved a design solution that extends the boundaries of the project brief and adds value to the original concept and primary function. His aim is to not only provide a place to call home, but also to provide an investment opportunity, which the owners can be justifiably proud of. The stunning countryside at Arthurs Point provided the inspiration for the design of Bullendale. The design reflects the nature of the area, by integration of finishing materials, textures and a vertical aspect to the roof line, which mirrors vistas of the surrounding mountain range. Foley Group Architecture Ltd is a Licensed Building Practitioner and an accredited member of the New Zealand Institute of Architects. Bullendale is located within the established residential neighbourhood of Arthurs Point, on the leafy back road between Queenstown and Arrowtown. Set against the rural country backdrop of the Wakatipu Basin, this development is surrounded by impressive alpine scenery. "Places that we all know, love and value are defined by a strong vision and community spirit. Making that happen is the art (and science) of quality urban design. At Bullendale we have delivered our vision of a quality solution. We have ensured that Bullendale has been founded on best-practice urban design principles and international experiences. From the earliest stages the public realm has been crafted to optimise amenity for residents and achieve architectural appeal for every building. This has continued throughout the design and development process to ensure every aspect, every detail - adds value for all. 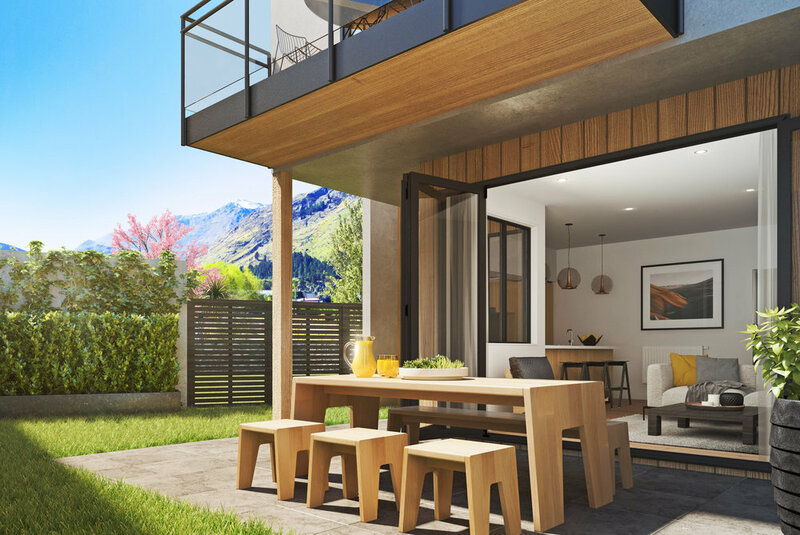 Collectively, these elements shape a place and community that will grow and strengthen with time and will become one of Queenstown's most desirable addresses." Less than a year since the start of construction, our first resident's are already enjoying their new homes in stage one. Check out some of the finished homes below. All unit images, floor plans and designs are subject to further design development and council approvals, which may affect the detail noted within these images. All images are artists impressions only.